Using colourful thread to embellish clothing, household items, and art is lots of fun. As a child and teenager, I enjoyed learning the basic embroidery techniques. I think it is a fun way to add unique touches to our belongings such as pillowcases and napkins. I enjoyed going through this Doodle Stitching Transfer Pack by Aimee Ray that has 300 beautiful designs of her popular motifs. We can tear the patterns from the perforated pages, and iron the reusable patterns onto fabric. Then grab a needle and thread, and start stitching animals, flowers, letters, balloons, embellishments, and more. There is no need to trace or photocopy when using this Doodle Stitching transfer pack. For example this design I did on a bag, I used the book as an inspiration and drew it. The author explains popular stitches we can do when embroidering in the beginnig of the book that is useful for beginners, and to inspire those who are already familiar with embroidery. 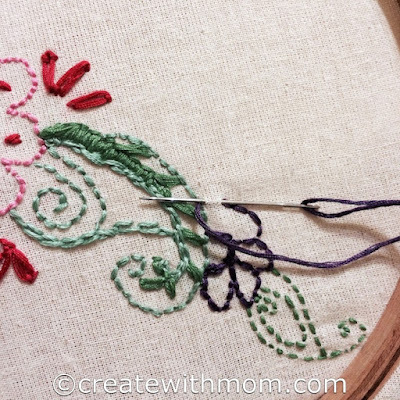 Click the image to see how to do Scallop stitch, Threaded running stitch, and cross stitch. I like that the pack comes with a handy, sealable envelope in the back of the book for us to store the motifs we take out from the book for future applications. We use to love doing this as kids. I really like the cover on the Doodle Stitching Transfer Pack book. This is so nice. My dd would love this. I'm not sure if she's quite ready for it, but I will definitely keep it in mind. Where did you get this? I checked for a link in your post, but there are none. I'd like to find one. That is pretty cool! I remember my grandmother would embroider our pillows like this. I've always wanted to do it myself. i have wanted to try embroidery for a while. what cute designs!! This would be a great way to customize linens for a gift. it has been years since i did embroidery, would love to teach my daughter! These are so pretty! Embroidery is always fun. Looks lovely, so much patience.